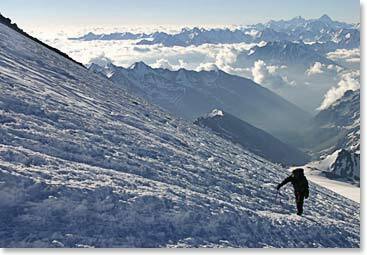 You get the opportunity to climb the three tallest mountains in Ecuador – Cotopaxi, Cayambe, Cotopaxi and Chimborazo standing at heights of 18,900ft/5790m, 19,350/5,9000m, and 20, 701ft/6,310m respectively. 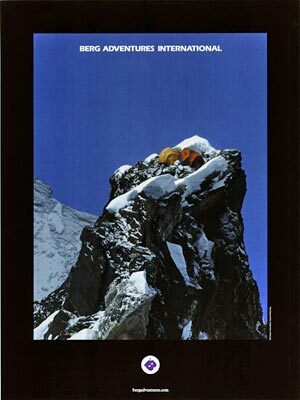 Berg Adventures guides are the best! They are experienced and enthusiastic. We provide great communication with your families back home in our daily dispatches! We also have an emergency 24 hour on-call phone number which your family members can call should they need to reach you while you are away. We always practice and review necessary skills before heading up the mountain. 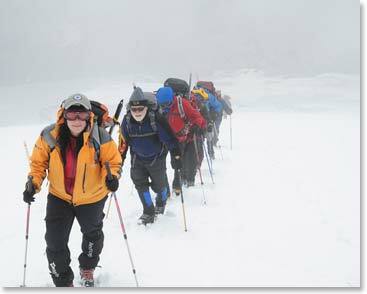 This trip will help you gain confidence and expand your mountaineering abilities. 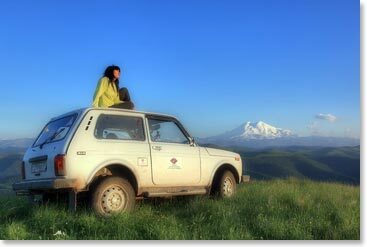 You will see beautiful snow-covered summits and dramatic volcano craters. 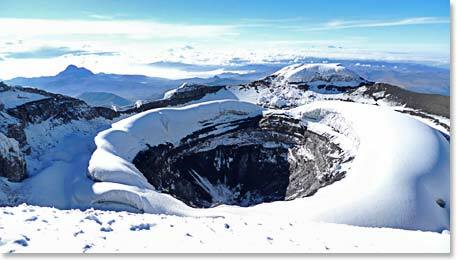 Plus, you will have the chance to stand on the farthest point from the center of the earth, the summit of Chimborazo. Ecuador is known for its colorful markets. We will visit one of the largest and most famous ones, the Otavalo Market. The culture of Ecuador is incredibly diverse. You will meet wonderful people, see unique works of art and taste delicious foods. Try the roasted guinea pig; it is a delicacy in Ecuador! You will see amazing sunrises and sunsets in the highlands of Ecuador. To recover from the rigors of climbing, we spend time at a beautiful hacienda with hot springs on-site. 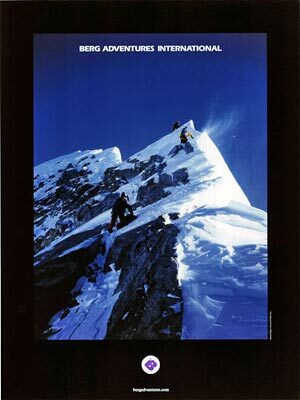 Berg Adventures climbers are awesome! 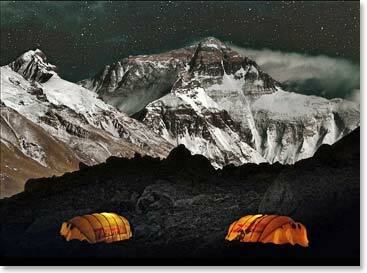 People who climb with Berg Adventures come from all over the world and are all passionate about adventure travel. 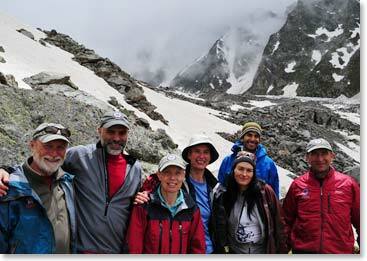 Join the Ecuador Expedition Team and find out for yourself! 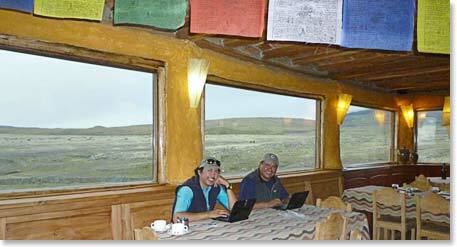 Berg Adventures guides Joaquin and Osvaldo working on dispatches in a comfortable mountain hut. 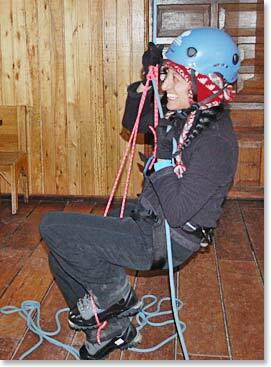 Practicing ropes skills in the hut before our first climb. 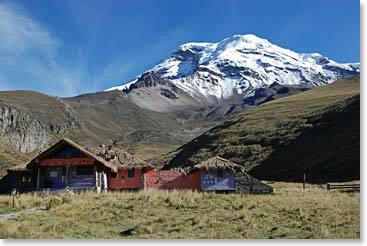 For more information visit the Berg Adventures Ecuador Homepage.